I’m tempted to just let the pictures speak for themselves. It’s difficult to describe this place in words. The most succinct thing I can say is that the views I saw from Zhangjiajie National Park in China were not just the best of our Asia trip, but the most spectacular natural views I’ve seen anywhere in the world. Thousands of towering sandstone karsts jut precipitously from the park floor towards the sky, where the evergreen forests that cling to the karst-tops merge ethereally with the clouds. You have to wonder about the wildlife on these tiny forests in the sky – do they know that they live on top of the world? 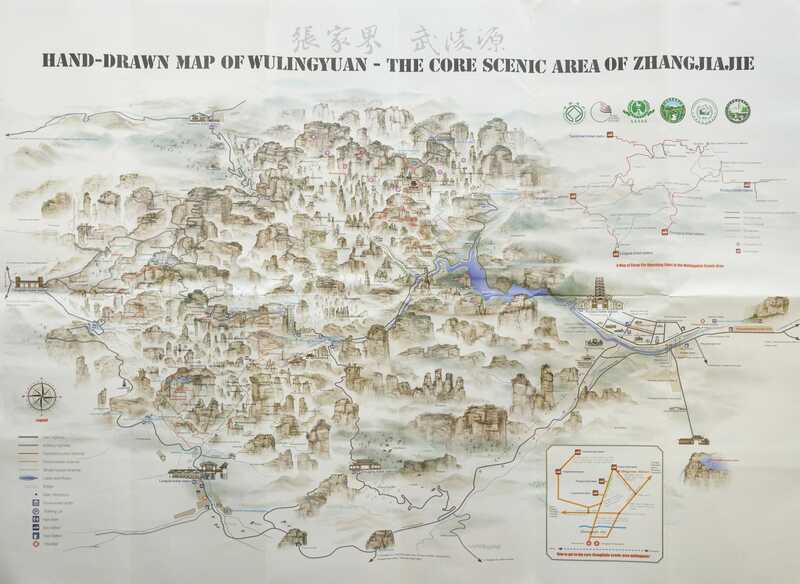 Armed with our beautifully hand-drawn map of the park, we entered Zhiangjiajie on our first day from the main Southern gate at the Loguta ticket station, and started on the Golden Whip Stream trekking trail. The trail starts out as a gentle riverside walk through the forest, following a crystal clear stream framed by the magnificent stone pillars on either side. Just after the Zicoatan peaks, we turned onto a steep, scenic staircase that 2,000 steps later had us eye-level with the tip of the karsts. This is where we came across two of the most popular sights in the park (and accordingly the crowds). The first, Lianxinqiao bridge, looks across to what is probably the tallest and most impressive karst in the park – Hallelujah mountain. At a dizzying 3,500 feet above ground, you just have to see it to believe it’s possible. If you’re scared of heights you might have trouble here as the bridge is made of a metal grid which lets you see all the immense way to the bottom. Hallelujah mountain is often referred to as the ‘Avatar filming site’ but I’m pretty sure this isn’t true. Just after Hallelujah mountain is Tanxia Diyi Quiai (the bridge across the sky) – an incredible gravity-defying bridge that you can cross over to visit a small temple. At 1,230ft above the ground, it may be the highest bridge in the world. From here we took the free bus to what is essentially the centre of Zhangjiajie park – Mcdonalds. (Yes, a huge Mcdonalds, slap-bang in the centre at Tianzishan) By this time it was getting late and the buses had stopped running. We weren’t keen on getting the ridiculously expensive elevator back down so we approached some shopkeepers and in some heavily app-assisted Mandarin managed to ask if there were any available rooms they knew of in the park. As it happened the owner of the shop owned some guest-rooms near his home, which he assured us were very comfortable. By comfortable, they had a bed, a hole in the bathroom for the toilet, and no heating. Since we were in the middle of nowhere and our breath was condensing in the arctic cold of the room, we snuggled in the single bed, popped some sleeping pills and listened to music until we fell asleep. The next day we woke up to find there was a trail that started right from our guesthouse. If you’re keen to avoid the crowds then this is the route for you – we must have have seen about three people the whole time. The cliff-hugging trail meanders through beautiful dripping wet forest with small detours that lead to viewing points on the tips of some of the karsts. The most memorable was Yibu Nanxing – One Dangerous Step – so named because to get to it you have to walk on a metal grate across a void between two pinnacles. We continued past small waterfalls and streams with rocky stepping stones until the path got too crumbly and dangerous to follow and we had to turn back. We figured this explained the lack of people. But we hadn’t yet had enough of Zhangjiajie for the day, so we took the shuttle back to Tianzishan and started the long hiking route to the east of Wolongling that would eventually lead us down to one of the park exits (Sansuo fire station). The map describes the surrounding area as ‘three miles of enchanting nature’, and it’s not wrong. We walked down what must have been thousands of stone steps through dense, verdant forest, past waterfall bridges and natural gravity-defying archways. We hardly saw a single other person except for a group of hikers at about half-way who, to my amazement, were making their way up. My legs were in agony from walking down the incredibly long, steep stepways so I can only imagine what they were feeling. I wonder if they ever made it all the way up. The third day was the mistiest. We took the trail that started right from Loguta ticket station to the Huangshizai scenic area (you can also get a cable car). Not seeing any people on our way up and looking relatively underwhelming from the map, we were wondering what to expect, but the views from here ended up being the most breathtaking in the park by far. An easy walking route once at the top, the walkway leads you past various different lookouts, each one more spectacular than the last. The views reminded me of ancient Chinese drawings I’d seen in museums and galleries, where the dark, decisive outlines of the mountains in the foreground gradually fade into the faint, delicate outlines of the distant peaks, until they eventually disappear altogether into the mist. With only the tip of some karsts visible through the clouds, I could see why people think Zhangjiajie is the inspiration behind Avatar’s floating mountains. Oh, and be sure to take the cablecar either up or down, it’s terrifyingly stunning.